CNN is planning an Oscar special tonight with HLN's A.J. Hammer hosting 'Showbiz Tonight: Road To Gold' from 6:30pm (eastern). Details from CNN below. 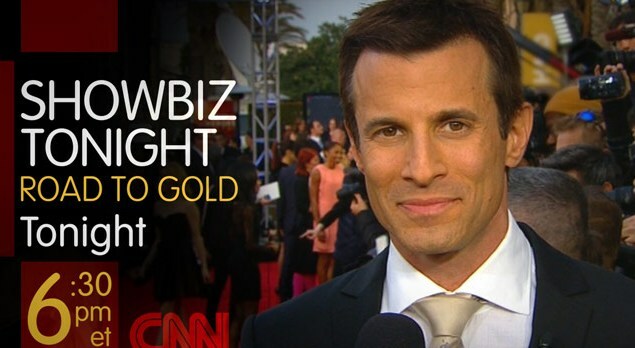 CNN’s Oscar special “Showbiz Tonight” host AJ Hammer covers the 84th Annual Academy Awards live in the 90-minute special “Showbiz Tonight: Road To Gold” airing Sunday, Feb 26 at 6:30 p.m. ET on CNN. Joining AJ as Hollywood’s biggest stars arrive will be “Showbiz Tonight” correspondent Nischelle Turner live on the Red Carpet, “Showbiz Tonight’s” Kareen Wynter reporting on the most anticipated showdowns expected Oscar night, and Lisa Vanderpump, star of “Real Housewives of Beverly Hills”, who will be providing special guest Fashion commentary. “We are thrilled to have Lisa Vanderpump with us this year. She was terrific as HLN’s Fashion commentator during the Royal Wedding and now we can’t wait to hear her take on what the stars will be wearing at the Oscars. The Red Carpet will be amazing and Showbiz Tonight’s Nischelle Turner will be there live with all the top Oscar contenders, like George Clooney, Brad Pitt, Meryl Streep, Michelle Williams, Glenn Close and Viola Davis. There’s a good reason they call this Hollywood’s biggest night of the year and the timing is really exciting for us because we are live at the Oscars the same week that Showbiz Tonight begins its eighth year on the air!” said Dave Levine, Senior Executive Producer, CNN Entertainment and Showbiz Tonight. In addition to the live coverage on CNN, audiences can broaden their Oscar night experience, online. Exceptional access to the most compelling moments from the 84th Academy Awards at www.cnn.com/showbiz. CNN.com’s Entertainment section will feature the evening’s nominees and winners, photo galleries of the hottest fashions, an Oscar-themed quote board, and red carpet coverage streamed live from 6 to 7:30 p.m. ET. The “Show Trending Stories” tab on the Entertainment section will also present the most popular, user-driven Oscar stories according to related user activity in CNN.com’s comments, as well as on Facebook. Users can check The Marquee Blog throughout the night or follow @CNNShowbiz for updates from the red carpet, the award show’s most “buzz-worthy” moments, and the winners as they’re announced.